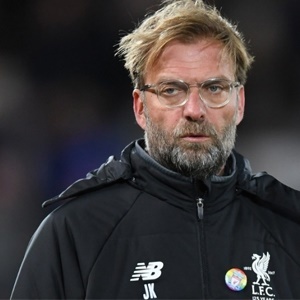 Stoke-on-Trent - Jurgen Klopp has pledged to keep rotating Liverpool during the Premier League's most hectic period after leaving out some of his biggest names against Chelsea and throwing away a 3-0 lead at Sevilla. Georginio Wijnaldum, Roberto Firmino and Sadio Mane were among those on the substitutes' bench for the 1-1 draw on Saturday, with Alex Oxlade-Chamberlain and James Milner among the men to benefit, while the in-form Mohamed Salah kept his place. "We had two little injuries with Emre Can and Dejan Lovren," said Klopp. "That is all. It was not a proper sign of being fatigued or anything but that is the best way to make changes. "Actually, you have to only decide between fit players. With the intensity of the last few weeks we need to consider it. "We ran 120 kilometres in the last game, and that was quite intense, Roberto is playing pretty much all the time... Mo played a little bit more but Sadio (has been) injured so these things you have to think a little bit more. "And it was all about making a line up for this specific game. 'Ox' deserved every minute he was on the pitch, and Daniel Sturridge deserved it." Salah is in sparkling form, with 15 goals in his first 20 games for the club, and the Reds will be favourites to win in the Potteries on Wednesday but need to find a way to see games out. Liverpool let slip a 1-0 advantage against Chelsea, having squandered a 3-0 lead against Sevilla last week but Klopp does not believe his team have a psychological problem. "They are two very different games, completely different games," said the German. "Having a 1-0 lead against Chelsea is no lead, it is only a little information. It becomes a real result only in the moment when the final whistle goes... so that is completely different (from Sevilla). "If somebody wants to think in that way I cannot avoid that probably. But I have not for a second the impression that it is a psychological thing." Stoke City boss Mark Hughes believes fans frustrated at Stoke City's performances need to keep things in perspective. Supporters criticised the team's performance on social media after the 2-1 defeat at Crystal Palace on Saturday. But Hughes, whose side are 15th, just three points above the relegation zone, wants them to take the emotion out of their assessments. "When you lose a lead or an opportunity to win a game, sometimes your emotion can cloud your correct perception of the game," said Hughes. "You've got to take a considered view and take the emotion out of losing games and look at it as we look at it and ask, what are we doing right and what are we doing wrong? "And I don't feel we are doing a lot wrong. There seems to have been a negativity from probably the beginning of the season and you only dissipate it by winning." Stoke have no fresh injury concerns for the clash against Liverpool, with Geoff Cameron (concussion) still to rejoin the squad after three weeks out.